President Donald Trump speaks at a campaign rally in West Virginia earlier this month. This is part of a trend: as Trump's presidency has gone on, these kinds of tweets have increased over time, with peaks coming in months with particularly bad headlines for the president. The range of things Trump is declaring fake is growing too. Last month he tweeted about "fake books," "the fake dossier," "fake CNN," and he added a new claim – that Google search results are "RIGGED" to mostly show only negative stories about him. He also accused NBC News' Lester Holt of "fudging" the tape of his May 2017 interview conducted shortly after Trump fired FBI director James Comey. An NPR analysis found that in the month of August, Trump sent out 46 tweets containing the words "fake" or "phony," far surpassing his previous record. (Two of the tweets were later deleted to fix typos). August was also a month in which former aide Omarosa Manigault Newman turned on the president with a tell-all book, Trump's former campaign chairman Paul Manafort was convicted on eight felony counts and Trump's long-time personal attorney Michael Cohen implicated the president in campaign finance violations when he entered into a plea agreement with federal prosecutors. In October 2017, Trump tweeted about things being "fake" or "phony" 30 times. It was a record for the year, with two events dominating Trump's tweets. Trump visited hurricane-ravaged Puerto Rico and declared the response a success all while fighting with local officials who begged for more assistance. As that month closed out, Trump's attention turned to the Russia investigation, especially after Manafort was indicted and George Papadopoulos, a former Trump campaign foreign policy adviser, pleaded guilty to lying to the FBI. In June 2018, a month with 31 "fake" or "phony" tweets, Trump took issue with coverage of the Singapore summit with North Korea, family separation along the U.S.-Mexico border and, as usual, the Russia investigation. "Donald Trump more and more is calling into question every other source of information besides himself," said Brendan Nyhan, a professor at the University of Michigan who studies misinformation and trust in the media. 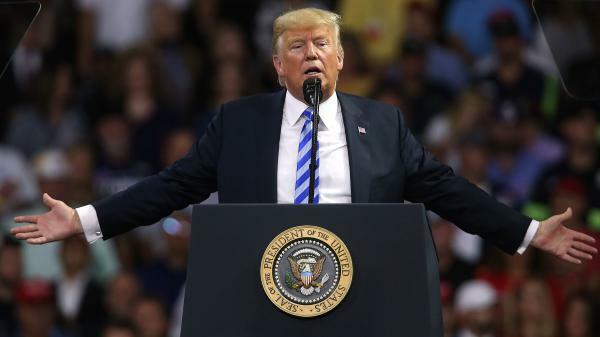 While some of Trump's core supporters believe him unflinchingly, for others the tweets and similar statements raise doubts and sow confusion about what the truth really is, said Nyhan. "I think Americans are often very concerned when they see leaders with authoritarian tendencies telling their supporters things that are false over and over again and attacking other sources of information," said Nyhan. "And if that worries you when you see it abroad, it should worry you when you see it here too." Trump is far from the first president to grouse about the way the press covers him, presidential historian Michael Beschloss said. What's different, Beschloss argued, is that Trump doesn't seem to share his predecessors' appreciation of the necessity of a free press as contemplated by the country's founders. Trump also has a unique ability to deliver his complaints directly to the public via friendly hosts on Fox News and through his social media streams. "He's got social media that reaches perhaps 100 million people," said Beschloss. "We've never seen a president before with that kind of weapon." Often when Trump says something is fake, it isn't false. Rather, he just doesn't like it. On May 9th, he posted a tweet that pulled back the curtain on this idea; "91% of the Network News about me is negative (Fake)," he wrote. "They don't cover stories the way they're supposed to be. They don't even report them in many cases, if they're positive," Trump said at a press conference in June. "I came up with a term. Fake news. It's a lot of Fake News." Trump used to say the monthly unemployment figures were fake too. "Because the number is a phony number, five percent," then-candidate Trump said in August 2016 during a speech in Florida. "It's not down to five percent. It's probably 20 or 21 percent. Some people think it's higher." But that was before the election. Now that Trump is president, he no longer calls the unemployment rate phony. In fact, he touts low unemployment as one of his great achievements and complains the "fake news" media doesn't cover it enough.